Having a rustic themed wedding is nothing new – people have been marrying in fields, wearing wellies and stringing up their own handmade bunting for years. But what about when you want that rustic feel, but at your destination wedding? Luckily, for those thinking of having a rustic wedding in Spain, you’ve picked the perfect country. Forget boring fields and mismatching chairs, we can do a lot better than that! Mallorca and the south of Spain have a huge array of old country wedding venues that are brimming with rural charm. From castles and farmhouses, to agricultural lodges and traditional Spanish fincas, you can get married surrounded by sweeping mountains, thousand-year-old olive groves or even barefoot on a windswept beach. No wellies in sight! A rustic wedding is best enjoyed in the sunshine, wind in your hair and nature all around you. But, if you choose to have it at home, can you really guarantee the weather? In the south of Spain and Mallorca, you can expect sunshine nearly every month of the year. In fact, because of the heat, most ceremonies take place as the sun sets and the party really gets going once the twinkly lights are lit, and moon paints the Spanish campo silver. Isn’t that so much more romantic than being stuck inside a barn because of the rain? Everybody knows what makes a good rustic wedding really great, are the details. The sprig of rosemary and lavender tucked into the napkins, the succulents mixed in with the posy of flowers and the tea-lights dotted along the crumbling wall at dusk. If it’s details you want, then the wedding venues in the south of Spain and Mallorca make the very best backdrops for any rustic affair. We can source everything from lace fans and parasols, to finding you a white stallion on which to make your grand entrance. The only limitation is your imagination. This is the number one reason why our wedding couples choose to have their rustic destination wedding in Mallorca and Spain. The scenery is breath-taking and changes its brilliance from season to season. 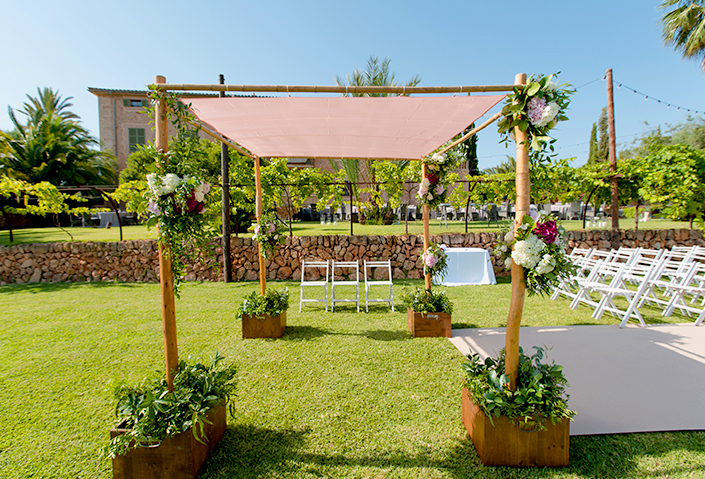 Enjoy an outdoor ceremony up in the Mallorcan mountains or sea-side beneath swaying palms. Perhaps you would prefer to be surrounded by orange and lemon groves or have your wedding meal in a working vineyard or beside a beautiful lake. How wonderful to know that wherever you look on your special day and night, you and your guests will be met by tranquil beauty at every glance. As much as no one likes to admit it, the best thing about having a rustic wedding are the photos. Cute flower girls beside the lemonade stand, vintage car winding its way up the mountain or the barefoot bride sipping from mason jars while listening to a Spanish guitarist. It’s those care-free, natural moments that you want to capture forever – which is why we work with the best wedding photographers and videographers in Mallorca and the south of Spain. You’ll be wowing your Instagram friends and Pinterest followers for years to come – and may even inspire future bridal couples with their rustic destination wedding ideas. For more information on how we can make your Spanish rustic wedding dreams come true, take a look at our site or get in touch.